Fine cuisine is alive and well in the school lunchrooms of France. The menu includes lamb tajine, veal, crêpes, organic veggies, pâté and organic bread. Oh, yes -- and a cheese course. In his hilarious, up-tempo and deeply subversive new movie, Where To Invade Next, schlumpy, flag-bedecked Michael Moore invades foreign countries “populated by Caucasians whose names he can mostly pronounce” in hopes of finding real-life solutions to America’s most intractable problems. As the invasion proceeds and the dominoes fall, Moore “steals” the best ideas from each country he conquers. They include tuition-free college (Slovenia and Germany); seven weeks of paid vacation and guaranteed maternity leave (Italy); universal health care and an effective antidrug program based on decriminalization (Portugal). From Norway, Moore swipes the idea of basing prisons on rehabilitation rather than revenge. In Iceland, he steals the defining features of the country’s school system, which is rated the best in the world. They include equitable funding, little or no homework, short school days, and plenty of time for discovery and play. Moore’s takeaways are pretty mouthwatering to a country struggling with downward mobility and loss of social cohesion, violence, mass incarceration, drug abuse, soaring college costs and underfunded schools that serve gloppy, toxic lunches. Nowhere is the contrast between the way things are done in Europe and the way they’re done in the U.S. more pointed than when Moore invades a French school lunchroom and sits down with kids who are eating a meal that would be classified as gourmet in the U.S. It starts with Coquilles Saint-Jacques (sea scallops), continues with a hot entrée, veggies and salad, and ends – this being France – with a cheese course. The kids are sweet and unknowing. Moore offers them a Coke he has smuggled into the cafeteria, but it's a hard sell. When he shows them pictures of mystery-meat school lunches in the U.S. they react with a mixture of doe-eyed horror and pity. In the past, Moore’s critics have accused him of oversimplification. But the facts on the ground bear him out, as I learn while exploring the French school lunch program. To get a close-up look, I seek out Bordeaux’s Deputy Mayor Emmanuelle Cuny in June during a press trip to cover Vinexpo, the tony wine trade show in capital of Aquitaine. Madame Cuny, Bordeaux’s school nutrition czar, advances the crazy notion that kids should have time to eat and that school lunch should be pleasurable. It sounds totally quaint and impossibly idealistic. But she means it. As the conversation continues, I start to feel like I'm in a parallel universe. Remembering the baloney sandwiches, chocolate milk and Fritos of my youth, I venture a question, pretty sure I know the answer in advance: Are kids allowed to buy snacks or bring their own lunch to school? "Kids should have time to eat and school lunch should be pleasurable." As the discussion proceeds, it becomes clear that we're in a sloppy joe-free zone here. Fair enough. This is France. But how far do the French really take their love of food? After all, we’re talking school lunchrooms, not Michelin-star restaurants. We talk about ingredients. The bar is high and parents expect a lot, Cuny says. “Maybe that’s because food is so important in our country,” she adds. It starts with bread. What I hear is skull-flattening. It would be unimaginable in the U.S.
“We serve fresh bread every day,” Cuny says as if it’s the most normal thing in the world. We’re not talking flabby industrial-grade loaves. We’re talking classic French bread with structure and a real crust, the kind you’d imagine eating with pâté and a glass of Bordeaux. We don’t get into the details, but I imagine the logistics must be the work of a master. The SIVU team has networked ten local bakeries to handle the task. Together, they supply bread to every one of the nearly 100 schools in the city within a few hours after it comes out of the oven – every day, week in and week out, all during the school year. 40 percent of all the food served in Bordeaux schools is organic. Fried food and hamburger-based dishes are rare. Cuny is justifiably proud that a full 40 percent of all the food served in Bordeaux schools is organic. Fried food and hamburger-based dishes are rare. Farm-to-table is in, and 70 percent of the vegetables come from the immediate region. Local chefs build meals based on ingredients like organic chicken, controlled regional lamb that is traceable to the farm where it was raised, certified Atlantic salmon, seasonal vegetables, organic fruit and dairy from the region and traditional cheeses from various parts of France. What does Cuny’s team do with all these wonderful ingredients? To get a fix on what kids are actually eating, you have to drill down to the level of the individual school menu. Take Thiers Elementary School in the city’s Bastide neighborhood, a random pick from among Bordeaux’s 98 neighborhood schools. Look at what’s on tap for the next three weeks, and prepare to be dazzled. Starting March 1, students at Thiers will be dining on dishes like Emincé de poulet (organic chicken from Périgord with herbes de Provence), carrot salad with garlic and parsley in vinaigrette, pork sauté with leeks in a pepper cream sauce, and organic apples for the fruit course. Poor kids -- they’ll also be suffering through risotto with vegetables, crêpes au fromage, couscous, vegetable flan, lamb tajine, cabbage salad in a mustard vinaigrette and the legendary blanquette de volaille, made with leeks, vegetables and cream. Non-pork alternatives are also available and vegetarian options are becoming more and more popular. Dairy and cheese selections at Thiers elementary school during March include fairly conventional fromage blanc, organic yoghurt and your basic Rondelé. But there are also stand-out cheeses. This month they include the ash-veined Cœur cendré from Livradois, and Comté AOP, a designated-origin cheese from the Franche-Comté region. Really? What’s not on the menu says as much about the difference between school lunch in France and the U.S. as what is on the menu. Take French fries. The kids at Thiers elementary school will only get them once in the next three weeks – probably a disappointment, but policies like these are why young people in France weigh less than kids in the U.S., where some schools serve French fries every day, diabetes is soaring and childhood obesity is pandemic. And the one day breaded fish is on the Thiers school menu in the next three weeks it will be a sustainably-sourced filet, certified by the Marine Stewardship Council, not a preformed minced fish patty, which is common in the U.S.
"If you're from the land of Velveeta and fish sticks, school lunches in Bordeaux look pretty exceptional." Menus at other schools in Bordeaux this month are just as diverse. That’s probably why the city’s school nutrition program has an 80-percent satisfaction rating among parents and why Bordeaux scored near the top in an independent national survey of school lunch programs three years ago. "It's time to eat like a local. Sign me up," I think to myself. If you're from the land of Velveeta and fish sticks, school lunches in Bordeaux look pretty exceptional. We’re in the epicenter of French wine country where eating is an art form and food and drink are valued above all else. Maybe that's why the school meals here rock. But, as I learn as I delve further and look beyond the Aquitaine, Bordeaux is far from the exception. France has developed savvy nutrition standards at the national level. Local governments of all political persuasions support them. Planners and school chefs take them seriously. There’s major buy-in up and down the country. Five-and-a-half hours north of Bordeaux, in Mormant, Thierry Grasset, the chef at the local high school, Collège Nicolas Fouquet, echoes the same sentiments you hear in Bordeaux and everywhere else. "We struggle every day to demonstrate that it’s possible to serve food where 75 percent of the ingredients are fresh, produced locally and the meals are prepared the same day they’re eaten,” he says, in a local report. Grasset prefers the name "school restaurant" to cafeteria, which speaks volumes. He plans meals with balance and variety in mind. Menus include hake with a shrimp, mussels and white wine sauce, cauliflower, Merguez sausage and lentils, ratatouille, veal and onions with sautéed vegetables, crudités and the occasional pastry. He only serves French fries once every four weeks. The more I learn, the more I realize how deeply school lunch is anchored in the social contract. There is such fundamental consensus about its importance that the French find a way to fund it -- even in metro regions where municipal budgets are stretched and a host of social problems compete for money. This is amply evident in Paris where kids have access to breakfast and good-quality lunches at schools across the city, even in areas with high unemployment, large immigrant populations and intergroup tensions. 135,000 meals are served every day. And whether it’s a rich neighborhood or a poor neighborhood, “meals are a special time of discovery and pleasure,” insists city hall. The 19th Arrondissement, on the northeast periphery of Paris, is the city’s most impoverished and racially divided neighborhood, so it might be safe to assume that schools there are lowest on the food chain. But kids in the 19th district have a place at the table, and the elementary schools there rocked the nation’s most recent school nutrition survey, scoring 19.1 points out of a possible 20. Mysteriously, the 7th Arrondissement, which is the city’s richest, only scored 15.7 out of 20. The school lunch program in the 19th Arrondissement faces its own challenges and it’s far from perfect -- for example it doesn’t offer as many organic choices as schools in other districts. But despite this, when you drill down to the individual menu level it’s pretty clear that elementary school kids in the 19th district are eating food that’s superior to, and more varied than, fare served to students in many schools in the U.S.
Take the month of March. While dystopian lunchrooms across the U.S. are serving up chicken nuggets, pizza, hot dogs, fish sticks, mystery-meat chili and fruit cocktail this month as they do throughout the entire school year, kids in Paris’s 19th district will be enjoying bistro-worthy fare that is inventive and balanced. This month, schools in the 19th will be serving veal with hunter’s sauce, salmon, soy steak with basil and tomatoes, sustainably-sourced pollock with lemon sauce, organic cauliflower and organic carrots, lentils, spinach gratin, veal au jus, organic couscous, and lamb with curry sauce. There will only be two ground beef dishes on the menu all month and the bread will be made from organic wheat. And don’t forget, mes amis: This is going down in the poorest neighborhood of Paris. It doesn’t stop there. Late in the month, school chefs are planning a special theme day spotlighting the cuisine of northern France. The menu will star a classic Flemish leek tart made with an artisanal cheese, called Maroilles. It also includes potato salad, chicory with croutons and a waffle dessert with chocolate and Chantilly cream. The salad side of the equation is no less astonishing. Can you imagine your kid’s school serving Batavia leaf lettuce salad with Tomme sheep's milk cheese and olives? What about salade de fruits frais? How about escarole with Emmental? Or endive with Mimolette cheese, croûtons and vinaigrette à l’orange? Can you imagine your kid's school serving Batavia leaf lettuce salad with Tomme sheep's milk cheese and olives? These are some of the salad choices that are on tap for lunchrooms in the 19th Arrondissement this month. For the cheese course it will be Comté, Coeur de nonette, organic Camembert and Cantal. 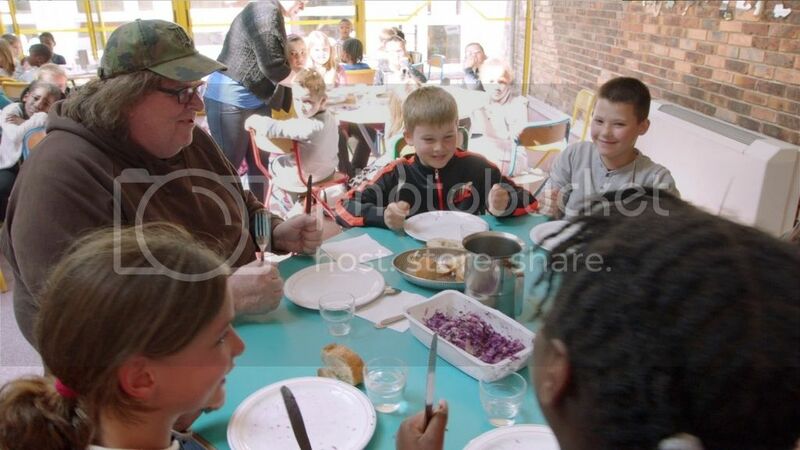 If Paris’s poorest schools can serve food like this, why can’t we? While Paris lunchrooms are certainly making a strong showing, school lunch programs in other parts of France are pushing the envelope even further -- probably because they have better funding and smaller populations to serve. Many are offering more variety and a higher percentage of organic ingredients. 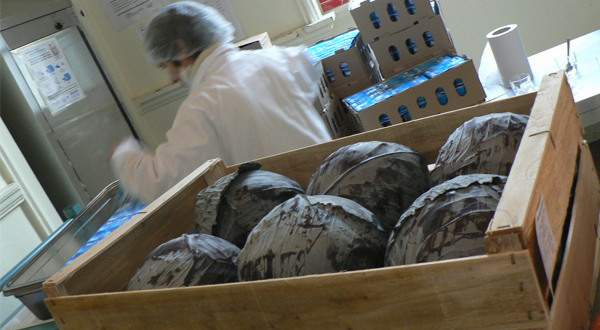 Local sourcing is the wave of the future. With the support of county governments, schools in many outlying regions are beginning to connect with local farmers through Manger local (Eat local) initiatives that are sourcing as much as possible from suppliers in the immediate area. In some regions this is creating markets where there were none, leading to new opportunities for small-scale farms. In addition, advocates think students will value local agriculture and feel more connected when they know the food they’re eating is from the local farmers. A message like this may be lost on first-graders. But older kids are likely to be more receptive as they begin to grasp the politics of food and appreciate the ideas behind manger local. Diversity, local sourcing and organics are growing to be hallmarks of the French school meals program. Emphasis on regional cuisine is another one. When schools can source the right ingredients, they’re not shy about offering terroir-driven artisanal dishes as part of the lunchroom repertoire, even including earthy iconic dishes like foie gras, duck, confit, kidneys and other specialties. Native cuisine like this is more common in regional centers and smaller towns in the hinterlands, where traditional ingredients are available and local dishes are prized. Some kids have all the luck. Trélissac schools serve dishes like brandade de morue, sardines and anchaud de porc, a swarthy pork confit. 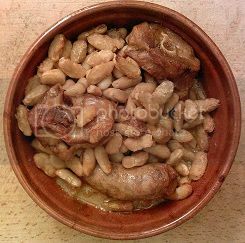 Caen includes cassoulet on its menus and students in Besançon get fricassée de lapin à la moutarde (rabbit fricassee with mustard sauce). Isère schools serve tripe Caen style and Montignac puts rillettes du Mans, an intense pork pâté, on the menu. Fare like this is not served every day and chefs know to balance it with less caloric offerings. It’s obviously not for the faint of heart, but schools are using it to expand the palette of choices and expose kids to regional culinary heritage. The French continue to tweak their school lunch program. Legislators have mandated cuts in salt, sugar, ketchup and mayonnaise. They're calling for fewer sauces, fewer fried foods and even more vegetables. But the bar is already pretty high. And as Bordeaux, Mormant, Paris’s 19th district and lunchrooms across the country are demonstrating every day, it’s clear by any measure that French schools are providing top-class meals to the children in their care. "French égalité is alive and well in the lunchroom." If good-quality school lunches were only available in some regions of France but not others -- or if they were only accessible to the country’s one-percenters and not the middle class and poor -- it would be easy to dismiss the program as a culinary training ground for the entitled few. But in no way is France's school lunch program a bastion of privilege and the country's schools are not in the business of training snobs. French égalité is alive and well in the lunchroom. The school lunch program is not only high quality, it’s democratic and it benefits everybody. With this type of investment in good taste, it’s no wonder nearly everyone in France knows what really good food is and delights in it. And, as Michael Moore shows us, it’s an idea worth stealing. Gourmet School Lunch Tour to France in 2017.